Companies conduct executive compensation benchmarking for a number of reasons, mainly to provide the compensation committee with an objective evaluation of the competitiveness of the company’s compensation levels and programs. Peer groups can be useful in helping compensation committees understand the amounts of target pay opportunity and actual pay delivered to executives at similar organizations, as well as the form and design of compensation found at those companies. Further, through the use of an effective peer group, compensation committees can gain a better understanding of relative pay and performance of their company versus the market. 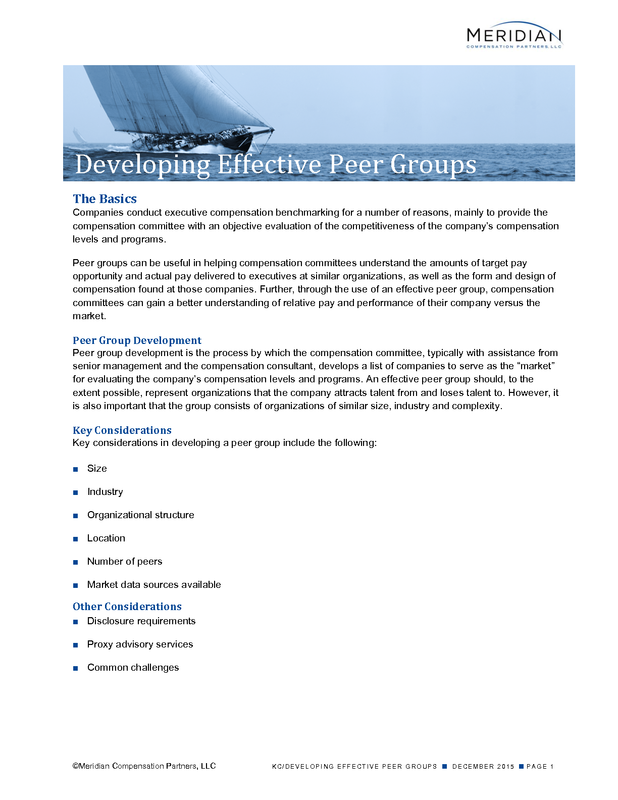 Peer group development is the process by which the compensation committee, typically with assistance from senior management and the compensation consultant, develops a list of companies to serve as the “market” for evaluating the company’s compensation levels and programs. An effective peer group should, to the extent possible, represent organizations that the company attracts talent from and loses talent to. However, it is also important that the group consists of organizations of similar size, industry and complexity. The following are typical screening criteria for selecting companies for a compensation benchmarking peer group. This list includes the most common criteria, but other factors might be considered based on a company’s situation (e.g., growth or performance considerations, company brand recognition, founder CEO status, etc.). Size—A company’s size is one of the greatest influences in the amounts of compensation opportunity provided to executives. For most industrial and service organizations, annual revenue as a size measure has the highest correlation to executive compensation opportunity. Total assets are a good measure for banks and other financial institutions, as well as industries with a high degree of capital intensity, such as oil & gas. Market value is a useful reference when combined with annual revenue or assets, but on its own is generally not a good measure of size for compensation benchmarking due to its inherent volatility. A general rule of thumb is to include companies with a size ranging from ½ to 2 times the target company’s size, with the median/average size of the peer group approximating the target company’s size. Industry—Industry sectors are an important consideration because they are a good reference for a company’s competition for customers, capital and executive talent. We suggest a company start by reviewing the companies that are in the same or similar Global Industry Classification Standard (“GICS”) industries or sub-industries and refine a list from there. Organizational Structure—The structure of a company will have an influence particularly when it comes to the size and design of equity-based compensation (e.g., public versus private). Further, business complexity, risk and global footprint are important considerations that can influence executive job scope and pay levels. Location—In general, we would say there is a national, if not global, labor market for executive talent. However, in certain circumstances it may be appropriate to consider the company’s region when developing a peer group. Number of Peers—A typical peer group includes 12–30 companies. A peer group with fewer than 12 companies can produce less than credible results due to the relatively high degree of influence that one or two companies may have on the summary market statistics. Further, with the increasing pace of company acquisitions and private equity buyouts, a company runs the risk of too few available peers in future years. Market Data Sources—Peer group data should be collected from either public information (e.g., proxy data for a specific peer) or professionally run surveys and databases. The specificity of the peer group as to industry or company names may be constrained by the data source used. Companies where the target company has recently lost or acquired executive talent (executive search firms may be a useful resource here). Publicly traded companies are required to disclose in the proxy statement Compensation Discussion and Analysis any peer group used in determining executive pay levels, as well as the rationale for peer group selection. Proxy advisory services such as Institutional Shareholder Services (ISS) and Glass Lewis have their own methodologies for developing peer companies for evaluating a company in their voting recommendation analyses. Further, they will comment on the size and composition of companies’ peer groups when evaluating compensation programs and practices for Say on Pay vote recommendations (most commonly the size of companies in the peer group). Size scopes (e.g., annual revenues, market value, assets) that are significantly above or below the rest of the industry. It is advisable to review the peer group objectives and companies on an annual basis and prior to disclosure in the proxy for continued relevance based on the company’s current situation.